So what’s a media blaster? 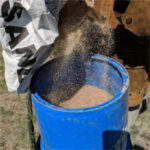 A media blaster is a simple pneumatic tool that meters media (sand, slag, soda, glass, walnut, etc) into a stream of moving air so it can be used to clean (polish, etch, carve, etc) surfaces. That’s it. There are three main elements that come into play when using a media blaster. All three are directly related and affect the performance, speed, and quality of the job. Listed below are the major things to understand about a media blaster. 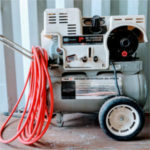 -Air compressors make pressurized air (psi) and deliver a volume per time or air flow (CFM). Each compressor is different but they all provide a fixed air flow at a specific pressure (CFM@psi). -Media blasters (including the Texas Blaster) don’t use air. Nozzles do. The size of the nozzle determines the size of the air compressor or to say it another way, the size of the compressor you need is directly related to the size of the nozzle you use. Larger nozzles require more airflow (CFM), and require larger compressors. 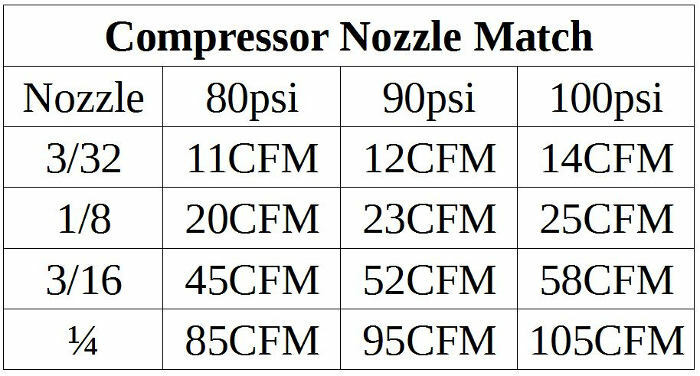 Refer to the Compressor Nozzle Match below for a generalized guide. -The size of the nozzle determines how much work you get done in a fixed amount of time. Doubling the diameter of the nozzle does 4 times more work. A 1/4 inch nozzle does 4 times the work of an 1/8 inch nozzle. -Choose the media based on the project. Choose the grit size based on the nozzle. For best performance, the nozzle diameter should be five times larger than the largest grit diameter. –Moisture is the enemy. This is the most important piece of information you can take away from here. Compressed air contains loads of water as a result of the compression process. Moisture causes the media to clump and stick in the hose and nozzle. Keep the air coming into the blaster as dry as possible with filter/water separators. *A note about the Compressor Nozzle Match Table: The table provides a generalized guide for matching compressors and nozzles. While it is fairly reliable, it is NOT set in stone. There are just too many variables: media choice, compressor hose length, blast hose length, environmental conditions, and the actual compressor CFM. It’s always a good idea to have more airflow (CFM) than recommended, extra is better. For most folks, the above information is all you need to get started. However, if you are yearnin’ for some learnin’, we’ve got tons more. We have in-depth sections on air, nozzles, and media. Click HERE to have a look at those. Also, if you haven’t already, take a look at the Frequently Asked Questions (FAQ) page. 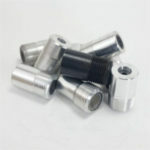 There is also a FAQ on most product pages to answer product related questions. Don’t forget, you can always email, text, or call if you have questions and can’t find the answers.